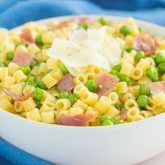 These Creamy Skillet Noodles with Peas are made in one pan and ready in less than 30 minutes. With just a few ingredients, this creamy and flavorful side dish is perfect when paired with just about anything! To be honest, I love a good side dish with dinner (remember these Roasted Mushrooms with Garlic and Rosemary or those Roasted Parmesan Herb Sweet Potatoes? ), but I often end up forgetting about it until the last minute. 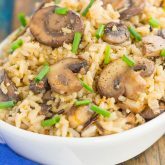 I love creating new side dishes to share with you on Pumpkin ‘N Spice, but when it comes to dinner time, my mind seems to go blank and I reach for the same ‘ole boring dishes. But since the holidays are fast approaching, I thought I would up my side dish game just a little bit, but still keep it simple and easy. After all, Thanksgiving is all about those yummy sides! There’s just something about noodles that are like pure comfort food to me. Do you feel that way, too? Pile on the noodles, add a touch of flavor, and be still my heart. 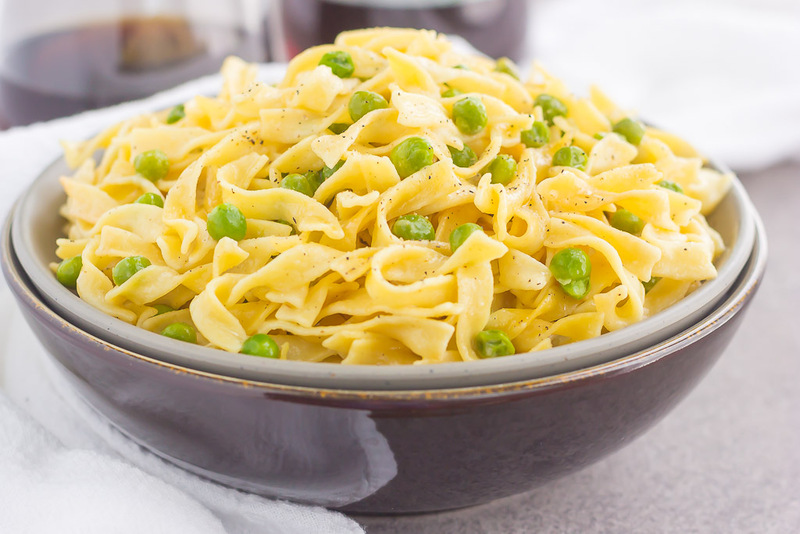 These Creamy Skillet Noodles with Peas are what my side dish dreams are made of. I was inspired by this dish from a cooking show that I saw a while back, and ever since then, I knew I had to make a similar version. 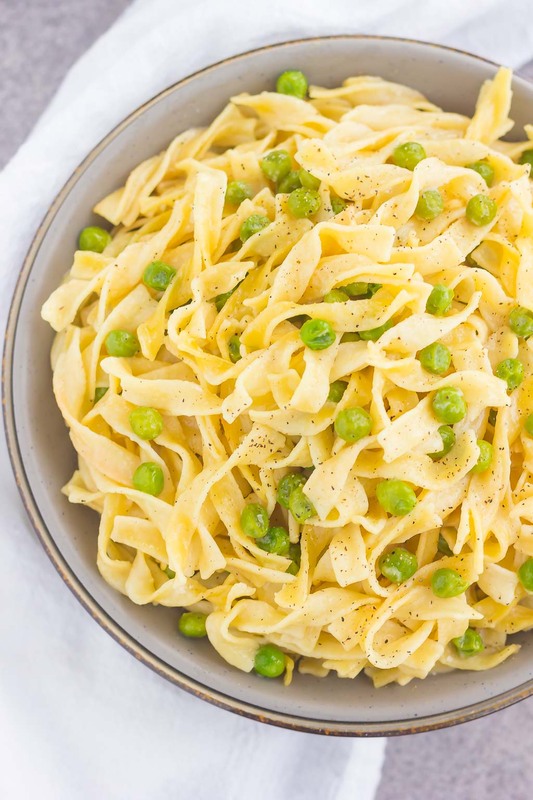 Egg noodles are tossed in a butter and olive oil mixture, and then cooked with some chicken broth, heavy cream, and some frozen peas. Simple ingredients is all it takes to get the maximum amount of flavor. 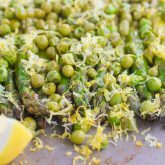 It makes the perfect side dish to pair with turkey, beef, or chicken. 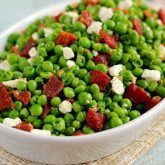 You can also turn this side dish into an entree by adding some protein. Or, keep it simple for meatless Mondays. One bite of these creamy noodles and your tastebuds will be wowed. 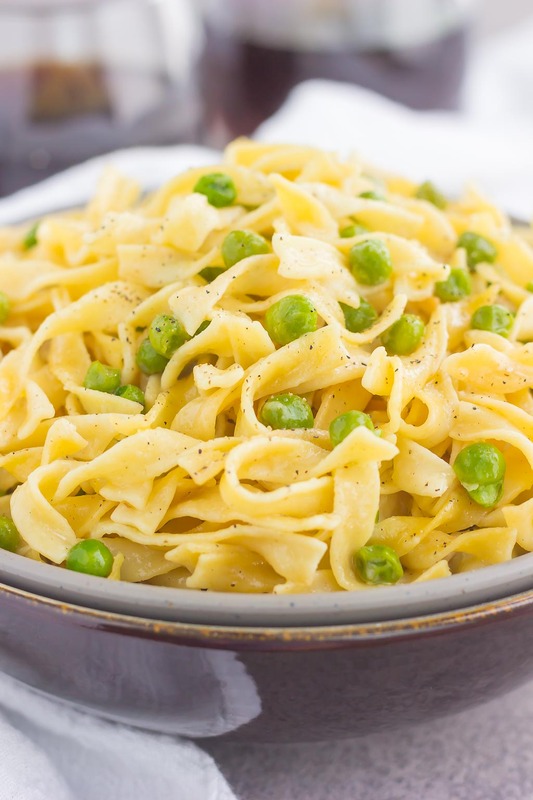 The buttery, creamy texture and flavorful pasta pairs perfectly with the crunch from the peas. So if you’re looking for your next easy side dish, look no further. 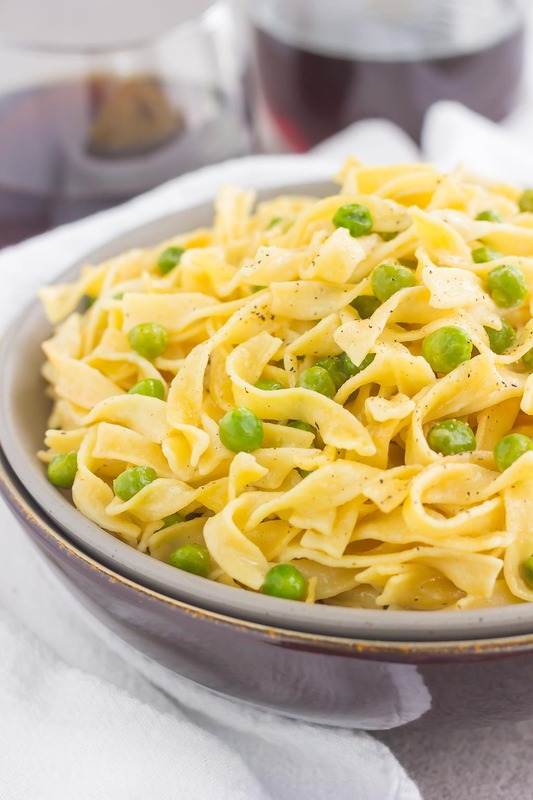 You’ll fall in love with the classic taste and ease of these Creamy Skillet Noodles with Peas! In a large skillet, melt butter and heat olive oil over medium heat. Add noodles and gently toss to coat. Stir in chicken broth, heavy cream, frozen peas, salt, and pepper. Bring mixture to a boil. Then reduce heat, cover, and simmer for 10-12 minutes, or until noodles are tender and most of liquid is absorbed. Stir and add more salt and pepper, if needed. If noodles are too thick once cooked, add an additional 1-2 tablespoons of heavy cream, if needed. Sounds like the perfect side dish! I'm like you -- I almost always reach for the same boring sides when it comes to dinnertime. My whole family would love this option, though! Can't beat how easy it is! I would totally happily just eat these as a meal! On the couch. In pajamas. They look so yummy! Haha cheers to that, Sues! My kind of pasta dish! So simple to make and delicious! Have a great weekend Gayle! I rarely cook with egg noodles, but when I do I always enjoy them! Thanks for the reminder....and I'm cooking with peas, today! I do the same thing at dinner time and prepare the same old things! You'd think we food bloggers would be making different dishes all the time but we get into the same old ruts too. :) I love that these noodles are so easy yet look so delicious! I'd forget about the main course with these around. Haha right?! We food bloggers need to get it together. Thanks, Marcie! Could I use sour cream or cream cheese instead? Hi Patti! I've never tried swapping the heavy cream with sour cream or cream cheese, so I really don't know how it would turn out. You could try 2% milk if you have that for a less creamy texture. Sour cream or cream cheese might work, but it might also affect the flavor. I'm not positive though since I haven't done this before. Thanks for stopping by!